There are many attorneys in Montgomery County that charge $2,500 or more for a comprehensive estate plan, including a Last Will and Testament, Maryland Statutory Power of Attorney, Durable Power of Attorney, and Maryland Advanced Directive. 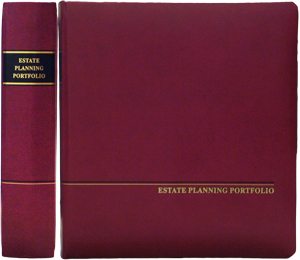 For this fee, the lawyer will provide you with a faux-leather binder for your estate planning documents. I recently met with a client who wanted to revise his 30-page Last Will and Testament, which had been prepared by a Rockville attorney. The client was an unmarried man with no children. This client did not need a 30-page comprehensive Will. He only needed a simple Will in which he left his home and vehicles to his life partner. Practice pointer for client: Most people only need a simple Will in which they leave all of their property to their surviving spouse and, if there is no surviving spouse, then to their children in equal shares. Everyone should also have a Maryland Advanced Directive, which appoints a healthcare agent to make medical decisions when you are no longer competent. As for the single man without any children, if he died without a Will, his entire estate would be distributed to his closest living relative, either his parents (if either were alive) or his siblings. With a simple Will, the single man could leave his entire estate to his life partner. Stewart A. Sutton’s rate for a simple Will and an Advanced Directive is $500 for a married couple and $300 for a single person.